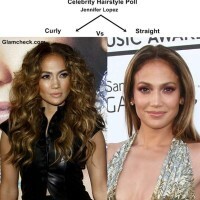 Long and curly hair, especially ones that are on the extra long side, are considered as a coveted jewel. Not very many can maintain this length or style of hair, and those who can ‐ get a lot of admiration from others. It has a Rapunzel feel to it, and if you are one of the lucky ones with such hair type then we do envy you (albeit in a nice way!). However, like they say, the grass is always greener on the other side, and many girls with such hair are often at a loss for styles that can capture its true beauty, without having to leave it open. Also, many feel it is difficult to go for DIY hairstyles with such heavy and long tresses. Well, this is precisely how today’s tutorial will help you. 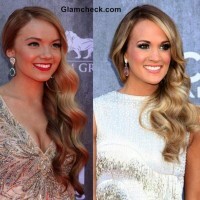 Glamcheck has a very easy DIY row hairstyle idea for very long and curly hair. Not only does it look beautiful and exquisite, but also easy and simple to make. All you need are a bunch of bobby pins and some pretty floral accessories to get started. Comb all your hair backwards. Separate the entire top half of your hair (the part covering the crown) and tie it in a ponytail in the middle of your head to make a half updo. Take a thin section of hair from the top right side of the head (next to the ear) and twist it. Now take this twisted section of hair across to the left side of the head (next to the ear) and pin it there with the help of bobby pins. Let the lower part of this section hang normally. Now repeat the same step as seen above, by starting from the opposite direction. So, basically you are going to take a twisted section of hair from the left side and pin it on the right. Repeat step 3 and 4, till you reach the neck area. You will now see that a pretty section of twisted rows have formed, one below the other, at the back of your head. 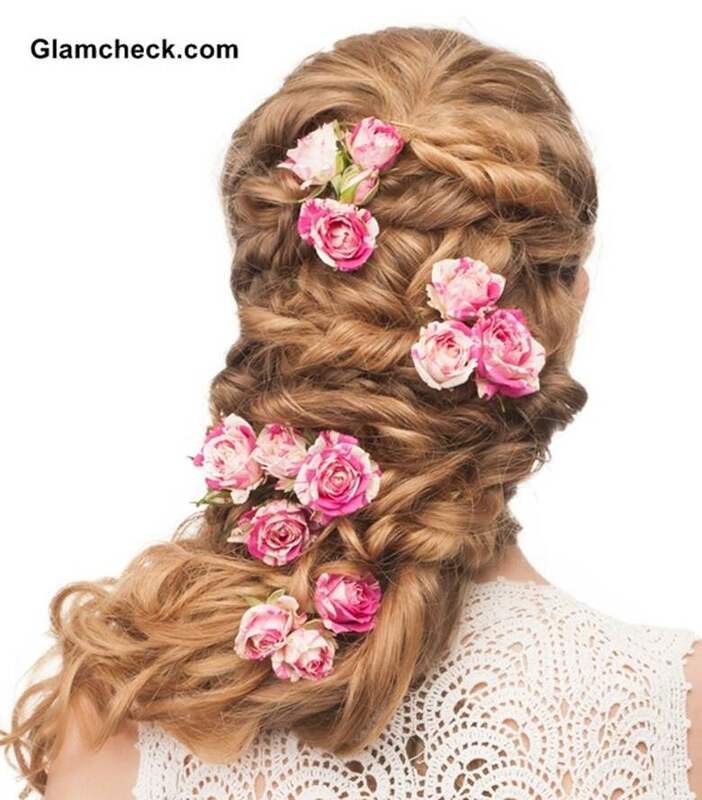 Add floral accessories at random to the various rows and sections of hair. You can also add them on top of the bobby pins, so that the latter gets hidden. And voila, your hairstyle is ready. It may look complicated and intricate, but is quite easy to do it yourself. 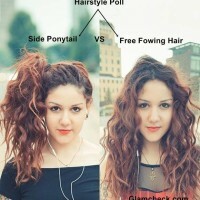 The same hairstyle can be done up in a different way. For this, gather all the open hair from below and scrunch it up in a half updo or bun and tie it securely. So, you can go from a day event to a night event with the same hairstyle. 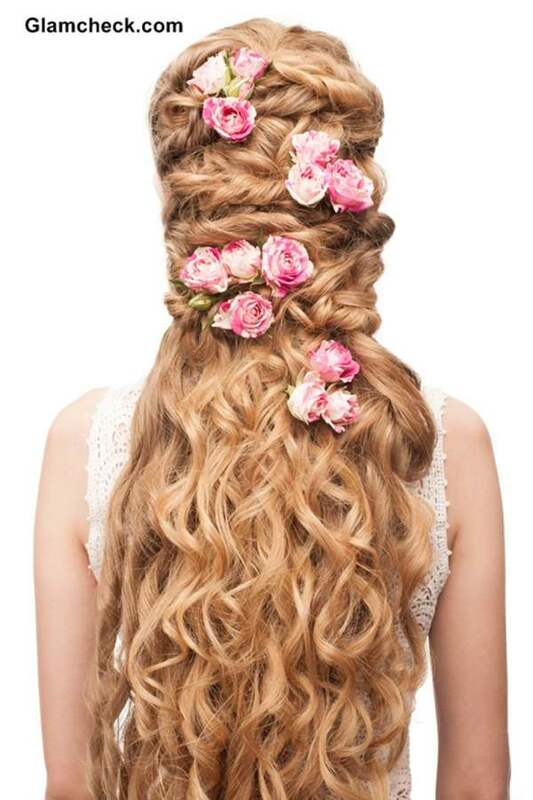 Giving good competition to princess and fairy like gorgeous hairstyles, seen in movies, books and paintings was never this easy with our row hairstyle for very long and curly hair.